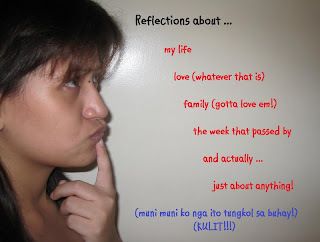 It has been 4 months since I last posted my life reflections. A lot of things has happened since then and I'm glad to say that it has turned out all for the best. I no longer work for Citi after being with them for over 2 years. I now work for a consulting firm and it has been quite an experience. The daily routine of being a regular commuter took some getting used to and the challenges of doing face to face sales is quite a new feeling. My family and I went through some severe potholes but because we are resilient, we came out on top and now, one of my brothers is managing our family business and things are working out for the best. My Mom and other brother will soon start a business of their own as well and I look forward to seeing things finally fall into place. FM and I had some disagreements but what I really love about him is that he continuously ensures that we are okay, that we sort things out, and that we are both in this together. He never lets go and always reminds me that though I have had bad relationships in the past, he is here to remind me what a good one is. I love him more for that. As for B, he is almost 7 now and though plans to give him a grand party did not push through, I am still happy because he is healthy, excited to learn, and is overall a good kid. I am able to do what I can for him and he is not lacking in any way. I have a great support system and I am truly thankful. Life has thrown me some lemons but I have made lemonades out of it. Life has thrown me apples and they have become delicious apple pies. Life has thrown me different kinds of fruits and they are now wonderful fruit shakes. With anything life throws you, I have learned to make the most out of it. I am happy. I am blessed. Happy Sunday everyone! Blessings comes to a beautiful person like you. And trials are set to make you stronger. Keep living the good life despite some wrong turns in your family life. Life gives you a lemon and you turned them into lemonade. Then you're given apples and made them into apple pies! Great attitude! So inspiring! life's sometimes tough but we have the option to handle them with joy! Keep the spirit! stay strong girl. :) remember to live life to the fullest. It feels ultimately perfect when you get back into the swing of things . Most likely tamang pagmumuni muni lang katapat nyan.You know sometimes it feels good to reflect yung tipong tamang realizations and contemplations lang. But wait for the right time nalang , trust me you will laugh about it. That's the spirit! The ultimate results in our lives will be decided by what we do with the challenges thrown at us. Always be grateful! That's the key to true happiness! I admire you looking at the sunnier side of life despite the rain! More blessings to come! Life is colorful and full of problem. Problem is a part of everyone's life as a lesson ,we learns from it. Goodluck on your new job. For me it's recycling the negative energy I receive into a positive power that thrives me forward. Sending you more positive energy to power you in continuing to create fruit salads of happiness! We only have but so much time given to us in our entire lifetime so it is sensible to make the most of every thing.